I was only planning on staying in Denmark for about a week, but instead I ended up staying for over two. I did a lot of doing nothing, but I still squeezed in a bike ride to my grandparent’s summer house in North Zealand and sorted out many of the last bits and bobs for my trip – picked up my camping gear, bought a handlebar bag, a new camera, insurance and some other boring stuff. The weather was pretty miserable so I was quite happy to be inside, but the main downer came in the form of the Copenhagen shootings. It’s a small city, so despite them not taking place particularly close to my Mum’s flat, they were still just a short bike ride away. 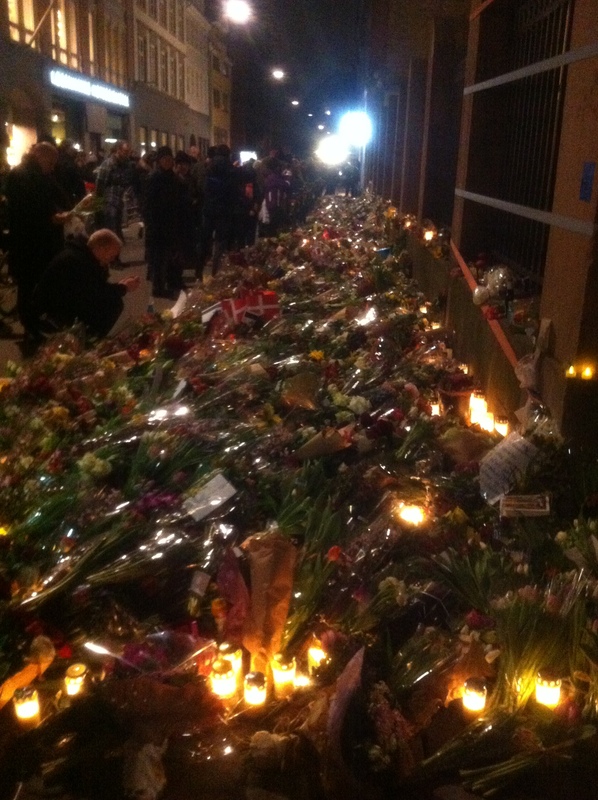 The following day we went to the memorial at the synagogue. I knew the street well – last Easter I’d been working in Copenhagen’s main library for a few days on a uni assignment just across the road. Where I parked my bike was just a few meters from where the shooting happened. You don’t need to travel to find danger, it arrives on your very own doorstep. When I was cycling France there were still Charlie Hebdo posters everywhere. In Belgium they’d just shot a couple of terrorists a day or two before I arrived. I was in a pub in Holland when that nutjob walked onto their news channel with a gun, and in Germany everyone was talking about their far-right Pegida party. It’s a strange world. 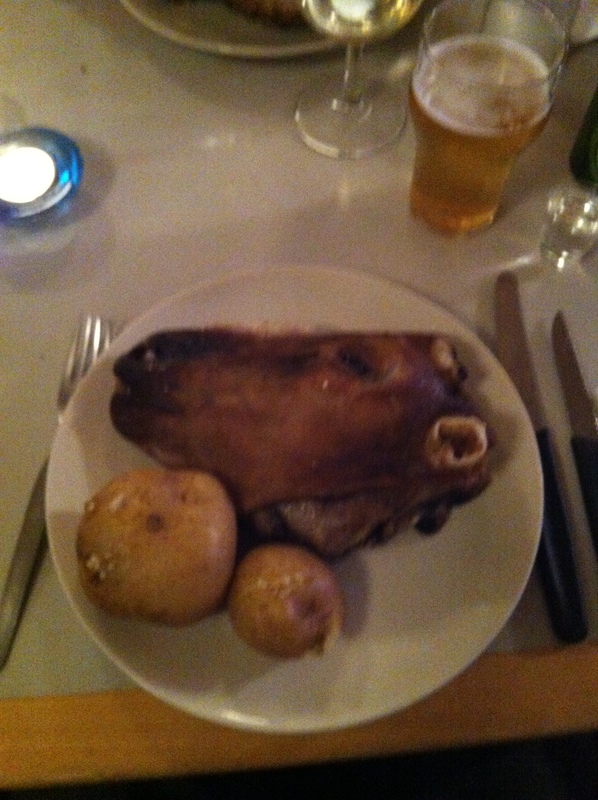 The strangest cultural experience of the trip so far happened in Denmark and came courtesy of my own Faroese grandmother, who took me to a traditional Faroe Islanders’ dinner – sheep head. (If you’ve never heard of the country, it’s 16 small islands somewhere between Scotland and Iceland. If you have heard of it, then that’s probably because of their unfortunate passion for whaling). The Faroese are a funny bunch – imagine a room full of pensioners holding civilised discussion while holding a sheep head in one hand and skewering the eyeballs and tongues out with their own knives that they’d brought along for the carving. 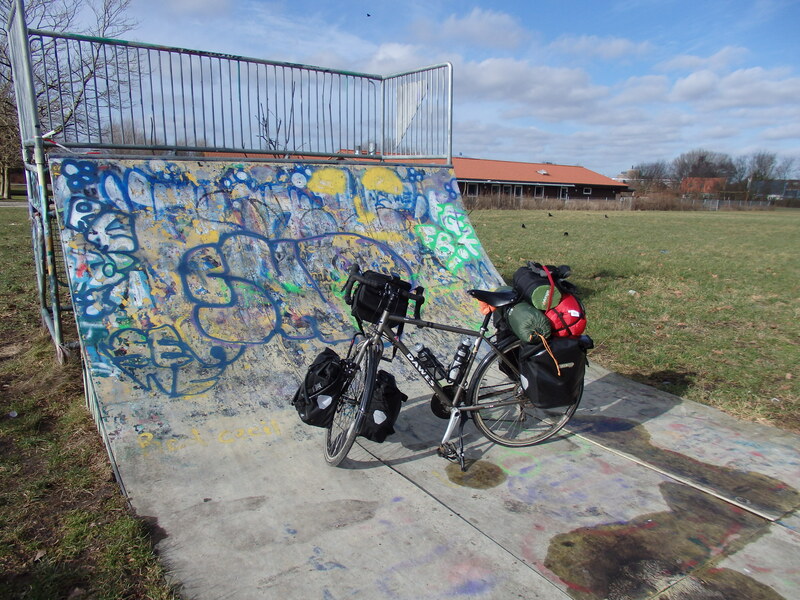 I eventually took off from Copenhagen on the 28th and decided to cycle to the harbour at Gedser in two days. This meant repeating many km’s from my route into the capital, which was annoying – but I was keen to get back into Germany as quickly as possible. 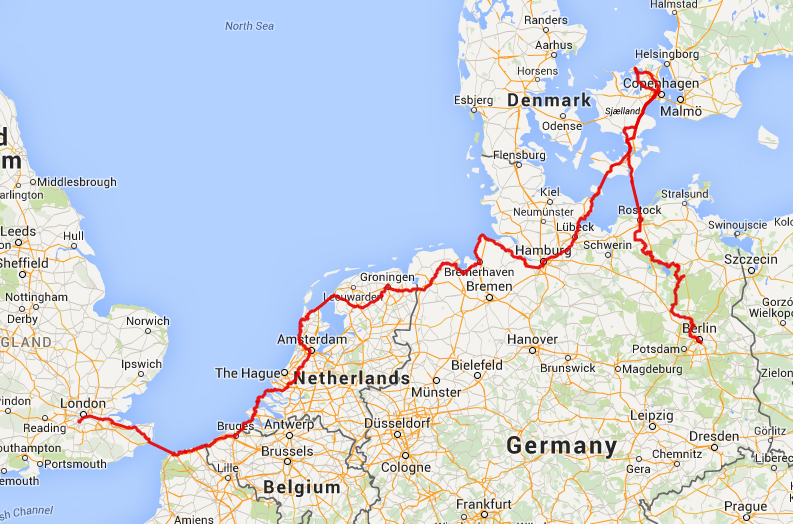 The first day I cycled 95km down to Vordingborg, where I Couchsurfed in a rural farmhouse. 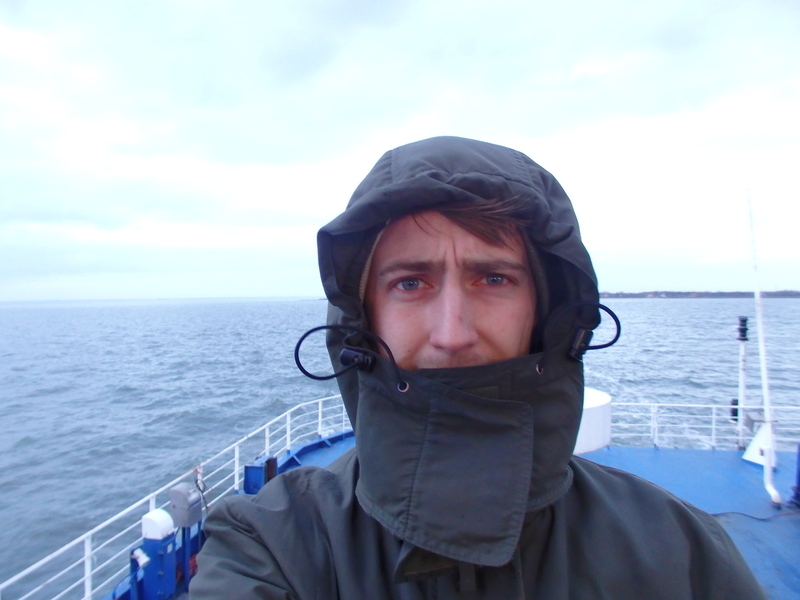 After days battling the headwind on my way into Denmark, as soon as I started to go south the wind decided to switch too making the day a real effort. The following day I’d planned on catching the ferry at 3.30 so that when I arrived in Rostock I’d be able to cycle quickly into town in time to catch at least the second half of the Chelsea vs Tottenham League Cup final. But the headwind was again exhausting on the long open roads of Falster and so I missed the ferry (by quite a way). Not the end of the world, I thought, they’ll have wifi on the ferry so I’ll just listen to it on the radio. But there was no working internet, so I sat for the two hour crossing annoyed at myself for being so slow. I arrived in Rostock in the dark. As I cycled towards town my gps route stopped and went straight across the water. My planned route was to take a boat over into town, but there was no one in sight and clearly no boat crossing running. I found a dog walker to ask for directions who told me I had to continue round the water through the forest and eventually the route would get me into town. She warned that it would be pretty dark and told me to watch out for the ‘pigs’. The forest was indeed pitch black, which I didn’t enjoy and I spent the route cycling precariously slowly squinting for charging boars. Finally made it to my host’s flat at 9pm. On my way up the stairs a rat casually scuttled past and by my host’s front door a shotgun was leaning against the door… But he turned out to be a great character, and explained the gun was to ‘take care’ of the stray rat. At various points he’d dart out into the stairwell with a torch in one hand and gun in the other to take a shot at the poor rodent. He missed on each attempt, but apparently poison or a trap was too boring an option. 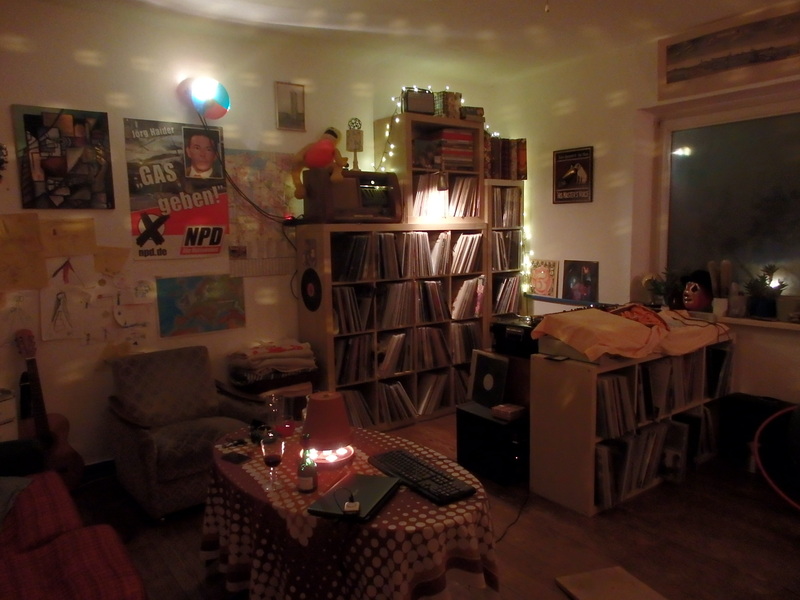 I got spend the night in the company of his incredible record collection of hip-hop and jazz. 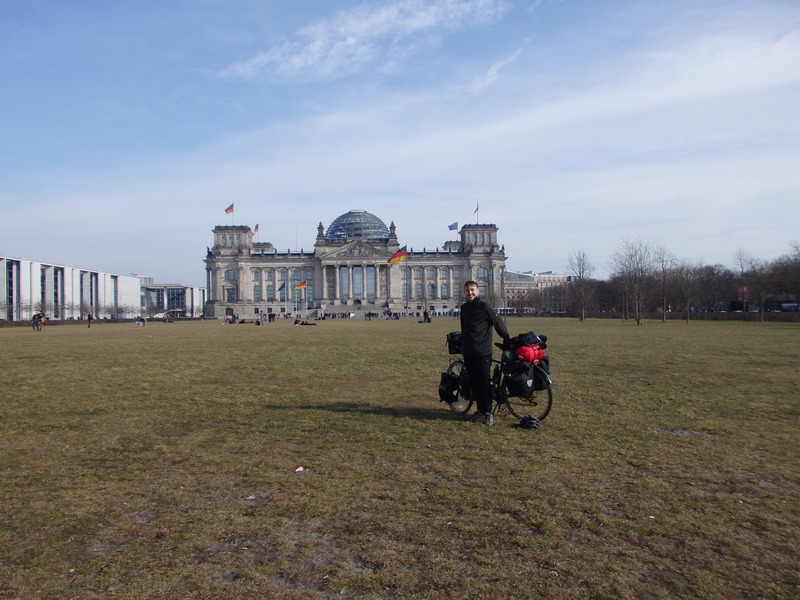 From Rostock I joined the Berlin – Copenhagen designated cycle route, which I would follow onward. I’d chosen not to follow the route in Denmark because from my time cycling there I’d been pretty disappointed by the scenery so chosen the quicker route. 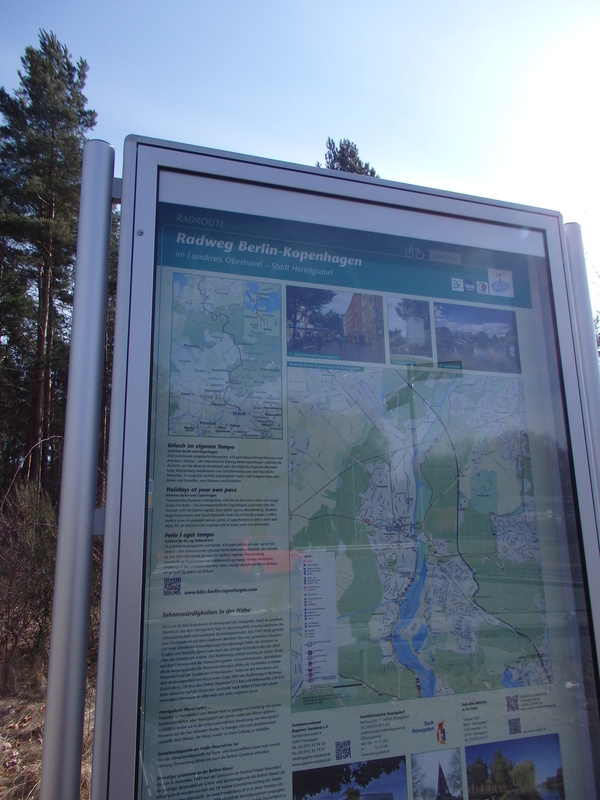 But from Rostock I was looking forward to following the trail through the national parks of Mecklenburg and Brandenburg. 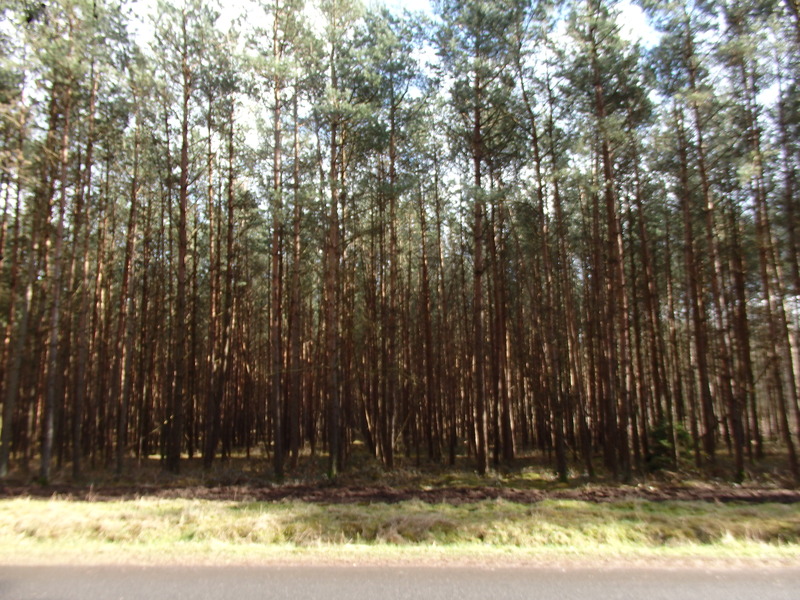 The route was rewarding, away from the traffic along neatley tarmaced paths, through deep forests and around lakes. 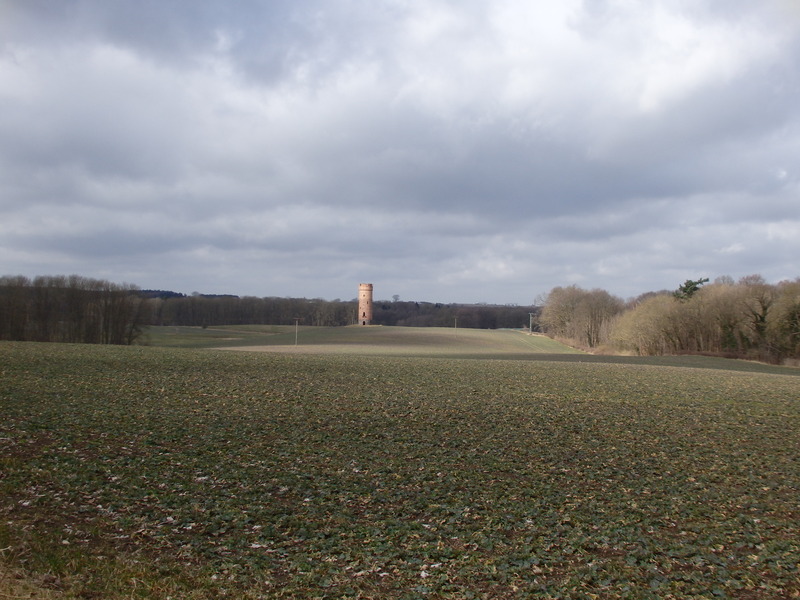 I spent one night in Gustrow, and then cycled to Waren (Muritz). The route was clearly very popular in season, but there were no other cyclists in sight. I was happy to have the forests to myself but it meant that any shop or cafe I passed was closed until summer. 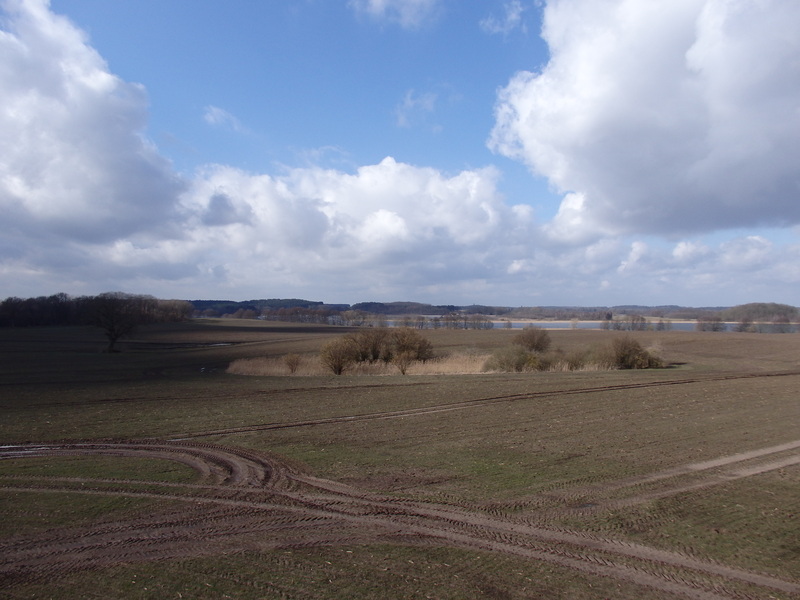 My host in Waren (Muritz) joined me for a few km, from where I continued to the small town of Neustrelitz. From there I had to deviate from the trail for a couple of days, as it was getting harder to find places to Couchsurf, so I headed south-west to stay with a family in Neuruppin. Although I was on ‘normal’ roads the scenery was still lovely, zig-zagging hilly forests and through little villages. 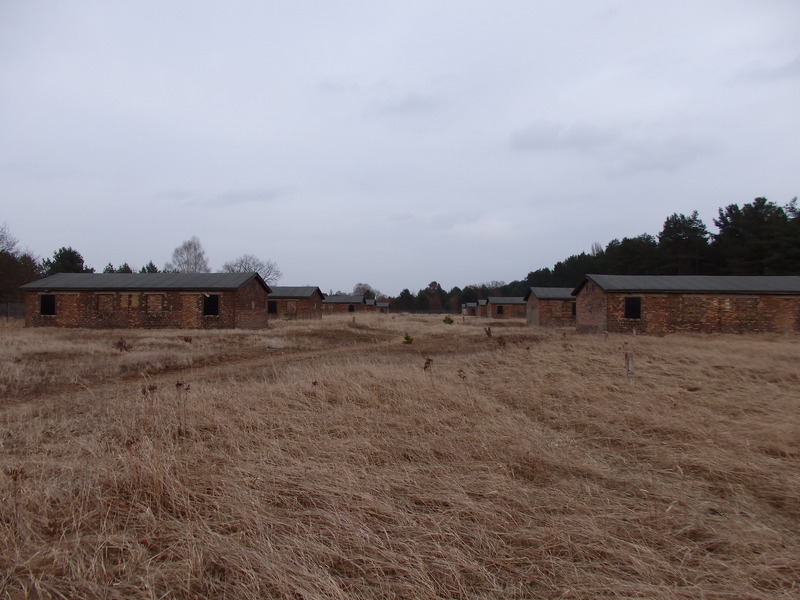 On the way into Oranienburg I stopped at Sachsenhausen concentration camp memorial. A gloomy and sobering excursion but one I’m glad I made. It was used by both the Nazis and the Russians after WWII, and had death written all over it. The site itself was huge, and I easily spent three hours walking around the memorial. 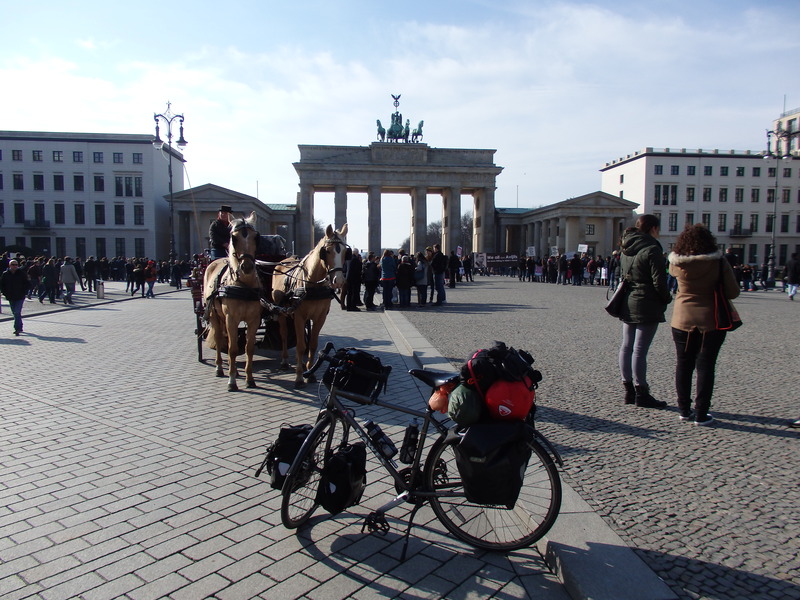 I detoured the following day back into Oranienburg to go past the castle, and then cycled into Berlin back along the Berlin-Copenhagen trail. The sun had suddenly come out of nowhere (after a really cold week), and I was able to cycle in just a t-shirt and fleece for the first time. I stopped for lunch and could eat outside without shivering in my coat which was amazing. The good weather coupled with the closeness of Berlin put me in a really good mood. I love Berlin, this was my fourth trip to the city and I was pleased to have a day off and see some familiar faces. I stayed with a friend at her flat in Neukolln, and another of my friends was over to DJ in a club called Ritter Butzke. I was a little worried about having the stamina to go out partying after a day of cycling, but still managed to stay until 8am which was a fete I was proud of. Slept for a couple of hours, but was awakened by the beautiful sunlight. Didn’t feel my best thanks to the previous night, but we went to an odd fleamarket on top of a carpark nearby and spent the afternoon drinking the hangover away. The weather was glorious, and it felt like spring had finally arrived. It was warm enough to spend the evening outside, so I managed to make the most of the amazingly cheap Sternburg beers. It was good to spend two nights in one place. Re-charged, I continued south on Monday.